Yes, it is about time! In today’s Christian Care Ministries blog post titled “It’s about time“, Dan Norris made the following statement. No offense to this well-intentioned blogger, but I find it difficult to believe that anyone growing up in evangelical America since the early 1970s could make such a statement. I became a Christian at the tail end of my senior year of high school (1972), and I can’t think of a Christian band in that era that didn’t write a steady diet of ‘Jesus is coming soon’ type tunes. 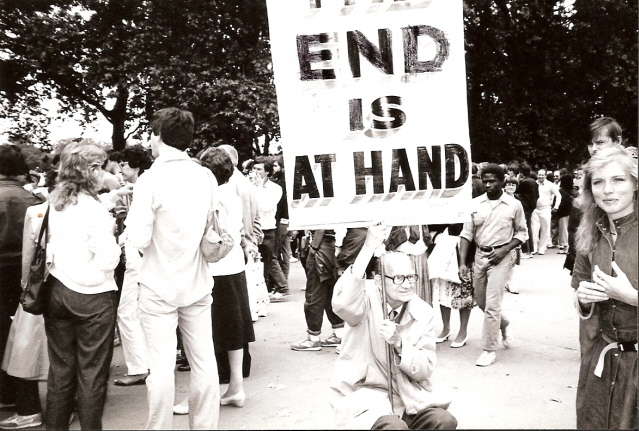 From “I Wish We’d All Been Ready” (1969) to “The King is Coming” (1970) to “I Can’t Wait to See Jesus” (1975), Jesus music (as it was called at the time) was fueling “the end is near” expectations. I can’t think of one Christian friend who wasn’t eagerly anticipating the Blessed Hope. So I find it very unusual that this blogger would only just recently think things have progressed to the point where Jesus really is about to come. 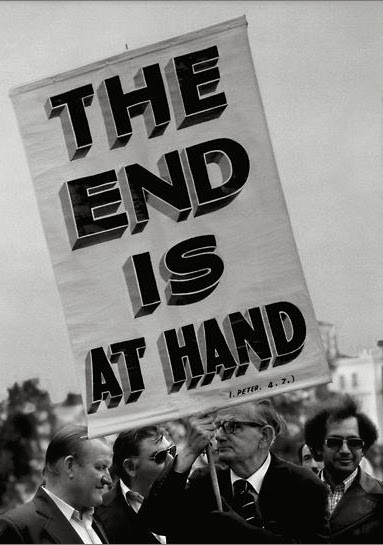 Since Lindsey’s The Late Great Planet Earth (1971), the ultra scary flick, “A Thief in the Night” (1972), followed by a steady stream of apocalyptic novels and movies like the “Left Behind” series, it’s a wonder any Christian would not have believed in the imminent return of Christ until now. Regardless, since this writer has finally joined the common refrain, I think it would be wise to ponder the following questions before moving on. Why has there been a significant uptick in the certainty that Jesus’ return is imminent? Is this pervading certainty based upon concrete biblical signposts clearly indicating that we are in fact nearing the end? If so, what specific signs would you point to that prove that thesis? Hold on to your answers for a moment and let’s move on in his short article where he quoted from Matthew’s version of the Olivet at the point when Jesus began answering the disciples’ “when” question (Matt 24:3). Jesus had just rocked their world when he emphatically stated that the massive and magnificent Temple complex (which had been under construction since well before any of them were born) would be utterly obliterated…so much so that even the gargantuan foundation stones would be unearthed. So, in response to “When will these things be?”, Jesus began to foretell the events which would lead to His coming (parousia). And this is the very text quoted to support his notion that Jesus’ coming is fast approaching. Though this has been a rather common sentiment for at least the past 5 decades, one would be hard-pressed to find a time since Adam’s Garden transgression, which hasn’t been “scary”. As you consider the centuries following Christ’s death, burial, resurrection, and ascension in approx. 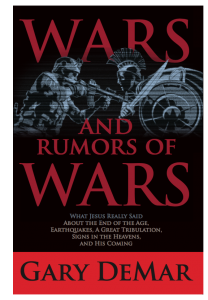 AD 30, ask yourself this: Has there ever been a decade, a year or even a few months without hearing of “wars and rumors of wars”? 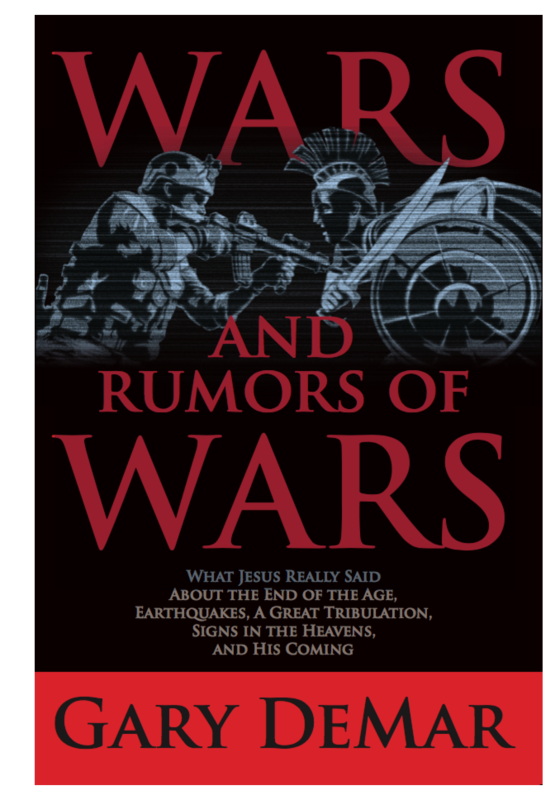 I’m not certain what specifically prompted this blogger to jump on the “Jesus is coming soon” bandwagon, but it’s not a stretch to assume that he (along with the majority), believes that there has been marked increase in wars, famines, and earthquakes. For a reality check, let’s look at the big three calamitous events beginning with wars taking place just in the past 150 years. In the 1860s our nation endured a Civil War so comprehensive and bloody that an estimated 700,000 were killed out of a population of only 31,000,000 (less than 10% of what it is today). That’s 2.25% of the entire U.S. population! Matter of fact, it is estimated that 1,600,000 Americans have died in all U.S. Wars. Consider these: the War of 1812; the Civil War; WW1; WW2; the Korean War; the Viet Nam War; 2 Gulf Wars; and the ever-present war on terror. But these numbers only reflect war deaths in the United States. How about worldwide wars and genocide just in the 20th century? So, given the state of world affairs today, October 31, 2017, do you believe that we are experiencing more or less war? Have the prophecy pundits been correct? Let’s move on to another one of the catastrophes mentioned in those 4 verses above: Earthquakes. Surely earthquakes are on the rise, right? A number of prophecy teachers say that a pronounced increase in frequency and intensity of earthquakes has occurred in the latter part of the twentieth century, a worldwide trend fulfilling a prophecy made by Jesus. 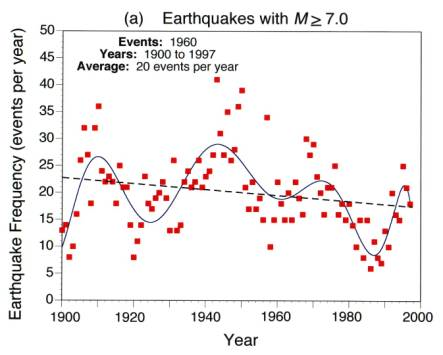 Contrary to these prophecy teachers, no obvious trend is found indicating an abnormal increase in the frequency of large earthquakes during the last half of the twentieth century. Neither is there a noteworthy deficiency of earthquakes in the first half of the century. Graphical plots of global earthquake frequency indicate overall a decreasing frequency of earthquakes through the century. 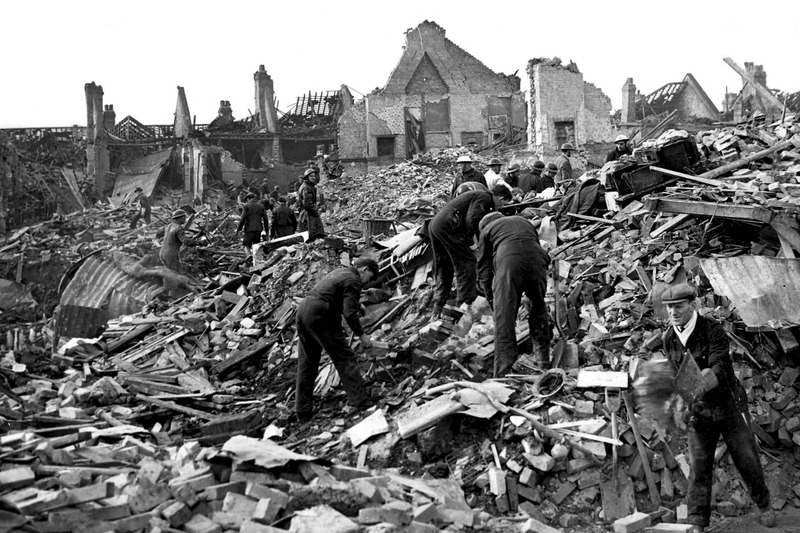 The decades of the 1970s, 80s and 90s experienced a deficit of larger earthquakes compared to earlier decades of the century. So again, should we not ask why today’s prophecy experts have led us to believe that earthquakes have been on the rise in both size and frequency? Is it possible that just like the errant perception regarding wars, they have been reading their assumptions into reality? Since they need to perceive an increase in mayhem to support their “end is near” arguments, and in too many cases their book sales, there seems to be a conflict of interest that should be factored into their predictions. Therefore, isn’t it incumbent upon us to take these prophecy experts to task when even a cursory overview of the data does not conform to their conclusions? 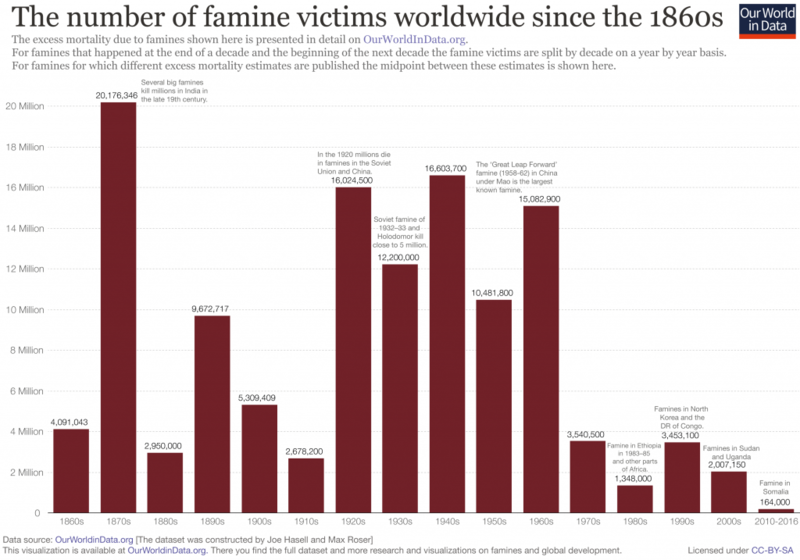 Well, then, how about famines? Are more people starving today than at any point in history? Let’s look at the facts. The first chart shows famines per decade since the 1860s and the second chart shows the number of famine victims worldwide in that same period of time. The numbers are startling given the various prophecy guru’s rhetoric. 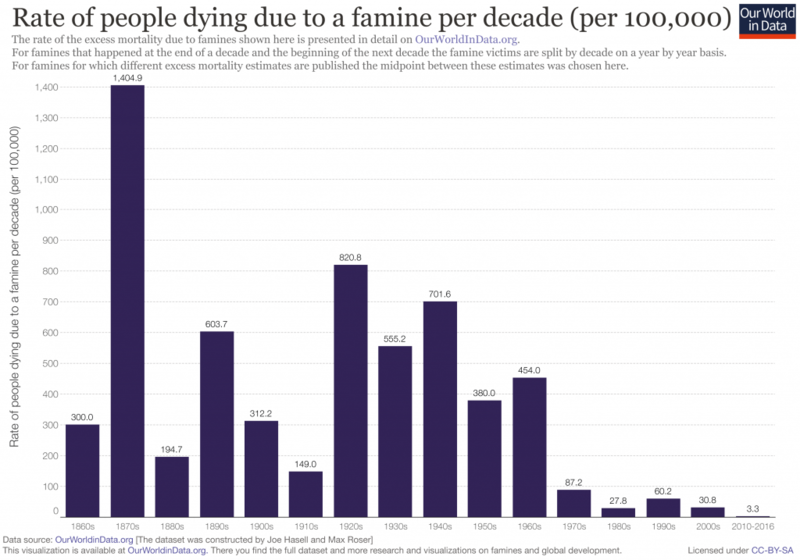 (source: https://ourworldindata.org/famines/) Listen, one death by famine is one too many, but for the purposes of Bible prophecy, the clear decline of famine-related deaths should be factored into our perceptions (that might not be rooted in reality). Though severe economic hardship is not mentioned in the Olivet (Mark 13, Luke 21, Matthew 24), since many today believe that financial devastation will be a sign of the end, let’s consider financial disaster as well. 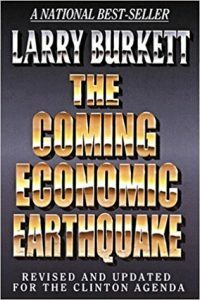 Larry Burkett, a well respected financial advisor who died in 2003, wrote “The Coming Economic Earthquake” in 1991. Three years later it was revised to include “The Clinton Agenda”. But isn’t the timing of a prediction every bit as important as the overall prediction? Sure, some of his prognostications are insightful and they can be useful in plotting one’s financial course. However, the problem is that incendiary titles like “The Coming Economic Earthquake” (which is obviously meant to be emotionally provocative) not only invokes fear but it ultimately causes an attitude of indifference if and when those predictions don’t come to fruition within a remote proximity to the time referent? How many trillions of dollars since the 2008-09 bear market, have Christians lost who have inculcated these often debilitating expectations into their psyche…and their portfolio? If one believes as the blogger wrote, “Tick tock, the time is drawing near“, that it is inevitable for the Titanic to sink, won’t that have a rather chilling and potentially debilitating effect on one’s decisions, both personal and professional? Perhaps, like this gentleman, we shouldn’t throw the baby out with the bathwater of these grandiose predictions (since Burkett provided some otherwise valuable insight), but I think it’s also prudent to ask if Burkett’s views are solely based upon the economic and political policies he believers are deleterious to a free people. In other words, are there other overriding factors (perhaps eschatological) driving his rather dire conclusions? If these kinds of predictions are pragmatically based upon a person’s view of economics as they intersect the political realm, that would be fine. However, when one’s pervading biblical understanding is that financial chaos and calamity must come before Christ’s second advent, one’s interpretation of the data can be significantly skewed. No events can be accurately interpreted if our overriding presuppositions are incorrect. For example, let’s say we are in the midst of 40% decline in the market. Person “A” believes that this precipitous drop is a sign of the end, and they, therefore, convert their equities to cash and hard assets, thus locking in substantial losses. Convinced that things are going to continue to deteriorate, person “A” will undoubtedly not reinvest in equities for obvious reasons. Contrarily, person “B” sees the decline as a short-term market correction, stays invested and may even purchase additional significantly, now undervalued stock. So, as you can see, one’s view of Bible prophecy can drastically affect one’s decisions which will directly impact one’s future. This is exactly what happened in many cases during the 2008-09 market decline. Person “A” either never got back into the market or got back in at much higher prices 4-5 years after the market had gone through a significant rally. And person “B”, given equal financial status to person “A” at the time just prior to the bear market, is now worth considerably more than person “A”. This is why well-intentioned books like Burkett’s can be deleterious to one’s long-term financial health. One’s view of eschatology is a major driving force in decision making. Even those who say that they are panmillennial (it will all pan out in the end), are far more affected by the gloom and doom hype than they realize. Though Burkett’s catastrophic prediction was clearly wrong, in context let’s take a peek back to the economic earthquake which began in 1929. The Great Depression was so severe that suicides went up substantially. There was a deep, pervading sense of hopelessness. And I can’t even imagine how much worse things would have been had those in the 1920s and 1930s been avid followers of today’s pessimillennialism. If the Left Behind series had been inculcated into the fabric of the 1930s church as it is today, I shudder to think how much more severe the depression would have been. But let’s say that we do experience another financial disaster on par or even greater than the Great Depression. 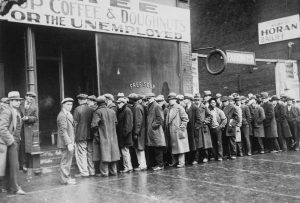 Why would it be a sign of the end when the Great Depression wasn’t? Why wasn’t the Black Death with a death toll estimate as high as 40% of all Europeans during the 14th century, a sign of the impending return of Christ? Why weren’t the famines which killed upwards of 20,000,000 Asian Indians during the 1870s, a sign of the end? Why wasn’t the 526 AD earthquake that hit Antioch, killing 250,000 (decades later the population was only 300,000), not a sign of Jesus’ return? Nothing that we are witnessing in this country or throughout the world is unique in history. Nothing! And this is absolutely critical to realize. J.D. King in “Why You’ve Been Duped Into Believing The Myth That The World Is Getting Worse and Worse” argues that things are improving worldwide. and he makes some rather formidable points. 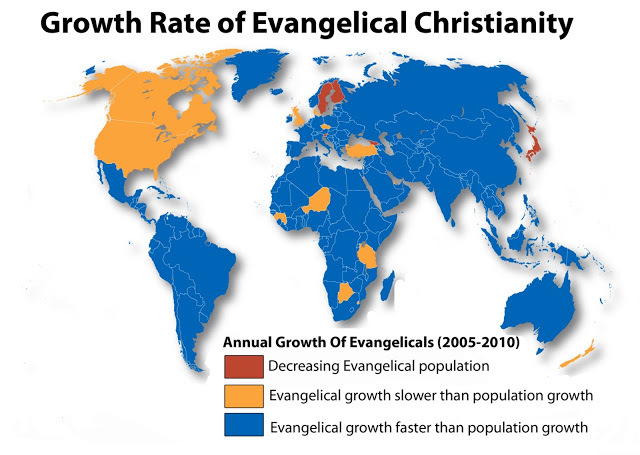 Look at Christianity’s growth rate in the world map. Just because the U.S. is experiencing a downturn (the main reason may not be what you have been told)doesn’t mean that this is the case worldwide. Did you know that China has as many Christians as does America and that the gospel is exploding throughout the world? We have become terribly egocentric and myopic. We are being inundated by 24-hour global news, most of which is decidedly negative. We have been repeatedly told that before Christ returns things must get worse. Our myopathy has a great deal to do with having very little historical context. Or perhaps it’s the other way around. It’s quite natural to think how bad things are compared to “the good ole days”. But the truth is that the good old days only exist in minds severed from past reality. Can you imagine what it would have been like living through the Civil War or the War to End All Wars if social media had existed? A 24 hour Facebook feed of nothing but death, destruction, fear, doom, and gloom. So coupling this kind of historical blindness with being constantly hammered by bad news (while writing this, my AP news feed told me that there were 8 dead and scores injured when a car driven by a Jihadi deliberately targeted a Manhattan bike path), can leave us with a rather helpless, pessimistic mindset. But, I would argue that this glass-half-empty worldview is antithetical to the proliferation and propagation of the Gospel. Now, anyone would be foolish to pretend that we don’t have significant problems. That’s a given in any age. But to believe that today’s “scary” times are worse than other eras is not only invalid but I believe it is unhealthy. So, not only must we interpret the Bible without a newspaper in hand (as is all too common today), but we must also use sound hermeneutical ( the science of interpretation) principles to understand Bible prophecy. Do you see the interpretational faux pas? When, for example, many Christians see the words “us” and “you” in Scripture, too often they immediately presume that they are being directly addressed. But what we must realize is that, although the Bible was written FOR us and for our benefit, it was not written directly TO us. There are plenty of passages like the Sermon on the Mount that generally apply to all people of all generations but there are others where specific people were addressed. There are those sections in Scripture like the thrashing of the religious elite in Matthew 23, where Jesus was specifically targeting those leaders living at that time. Notice the number of times Jesus addressed “you” as in the Pharisees and Sadducees. Have you ever read this passage and assumed that you will crucify prophets, that you will one day scourge them in the synagogues or that all the righteous blood shed on earth will fall upon you? Me neither. And that’s the point. This is no different than reading ourselves into Matthew 24. In the Olivet Discourse, Jesus was speaking directly to His disciples, not you, not me and not anyone from the 16th century or any other time period. Jesus never said anything directly to this blogger or anyone else in our generation. So why did this fellow write, “He tells US not to be alarmed.” Jesus was speaking directly to His disciples, not to us. And though this may seem trivial, one of the building blocks of sound hermeneutics is to consider the context which includes what is called “audience relevance“. So, as you consider the Olivet Discourse, perhaps in a new light, notice the number of times (20) that refer directly to the disciples. Once I began to read this passage with audience relevance in mind, my entire view of Bible prophecy underwent a major paradigm shift. And my prayer is that this blogger who wrote “It’s About Time” (and millions like him) will soon travel a similar path (to mine) and realize it is about time that we change our presuppositions and cast off errant views of Bible prophecy. Yes, tick tock the time is drawing near, but not the end of the world. What is drawing nearer by the day is our life on terra firma. Will we continue to propagate this dire end is near message that has crippled the church for at least the past half century, or will we realize that the glorious Gospel will, over time, transform this world into conformity with the Kingdom of Christ? The last thing to note as you peruse the following verses…notice, for example, that when Jesus said, “Then they will deliver you to tribulation”, “therefore when you see the abomination of desolation”, and “truly I say to you, this generation will not pass until all these things take place”, that you will understand to whom these things were said. This entry was posted in 2nd Coming, Audience Relevance, Eschatology. Bookmark the permalink.